Before we talk about the benefits of a sauna in your backyard, a little history of the evolution of the sauna is helpful. In prehistoric times, fire and heat meant survival through cold nights in any climate. People would find a cave or dig an area in the side of a hill and cover the opening with animal skins to keep out the elements. This would become their temporary home to live in, and they could heat it with fire. Soon they realized that the stones which surrounded the fire continued to give off heat even after the fire died down. In a broad sense of the word, these dwellings were a primitive forerunner of the sauna. The importance of these dwellings was survival itself. Eventually, these dwellings evolved into a separate structure where higher temperatures could be achieved. There is now a bucket of water and a ladle to add water to the hot stones kept close to the stove. The water hits the superheated stones and becomes steam which increases the humidity in the room. The steam is a crucial part of the process. The amount of humidity is a personal preference and is determined by the people in the sauna each time. This does not mean that the sauna is a steam bath. The steam should be visible and felt for only a brief amount of time and then dissipate. In Finland, where some of the oldest saunas in the world exist, the purpose of the sauna goes even deeper than a warm place to enjoy. Many of the original saunas were smoke saunas. There was no chimney for the fire. Instead, the smoke was contained in the room and only vented through a hole in the roof after the room was brought to the appropriate temperature. This could take over five hours and caused the walls to be coated with the residue of the smoke—but even the smoke residue was useful because it was believed it held antibacterial properties. In fact, the sauna was seen as the cleanest room in the community. It even became the place that women birthed their babies, and where the recently deceased were given their final baths. Because of this, the sauna gained an almost spiritual identity. Life began and ended in the sauna. Throughout your life, the sauna was the way you cleansed your body. It was believed the sauna could cure many diseases. It contributed to your peace of mind. This cleansing space retains its importance in today’s modern world. Eventually, the wood stoves used to heat the sauna included chimneys to vent the smoke, and this became the most common sauna until the 1930s. Then, in the 1930s, a new continuous wood fire stove was developed. This stove was put to use during WWII for “tick saunas” on the Russian front. Soldiers were plagued by ticks and lice, and the wood fire stove was instrumental in the treatment of soldiers and their equipment in these special saunas. Over 200 were built, and it is believed that this treatment decreased the incidence of red spot fever by eliminating the disease-carrying lice and ticks. A major change in the 1960s was the invention of the electric sauna stove. The principle remained the same: the stove provided the heat, stones were still used, and water added to the stones provided humidity at the level you preferred. Now, with just a push of a button, you could achieve the temperatures required for the sauna to be enjoyed—without the fire danger. It became possible to have a sauna in your family home or even an apartment. In Finland where saunas are the most prevalent, every home or apartment was being built with an additional room attached to the bathroom for the sauna. The community sauna lost favor compared to the convenience of an in-home sauna. Unfortunately, in the need to meet the demand, many of the new saunas were not of the best quality, and problems like poor ventilation which ensures fresh air were less than optimal. The most recent advance in the sauna is the invention of the infrared heaters. The infrared light is invisible to the human eye but is absorbed by the body, resulting in the production of heat. In other words, the room itself is not heated, your body is. This results in the same profuse sweating as the traditional sauna, as well as the same benefits. The cost of installing and running this type of sauna is much less than the traditional sauna, making it more accessible to the general public. Many health centers, spas, and workout facilities have added a sauna to the features they provide, and more people in the U.S. are enjoying the sauna experience for the first time in their own backyards. More than just the stoves of the sauna evolved. The design of the sauna also evolved into the wood-lined room with elevated wood benches that we know today. The elevated benches took advantage of the highest temperature because heat rises. 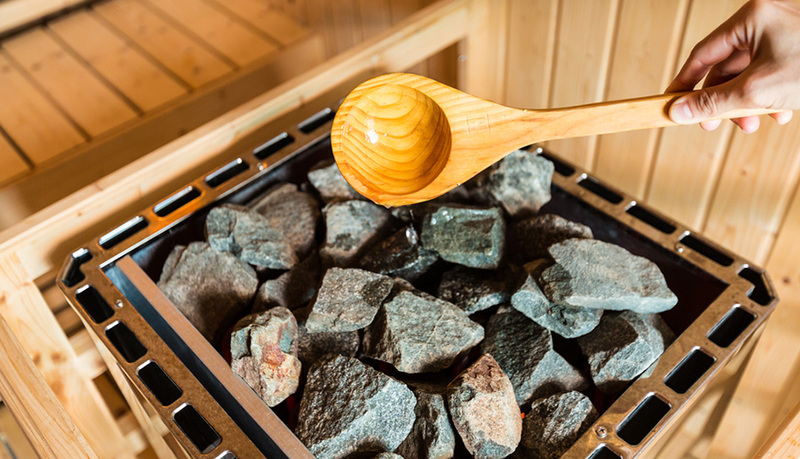 Inside the wood-lined sauna, there is a wood burning stove which has rocks on it to absorb the heat. There is an etiquette to today’s sauna experience that should be followed whenever possible. First of all, allow adequate time. You will need at least two hours (though some sauna enthusiasts say four hours is not too much time, either!). If you are enjoying your first sauna in someone’s home sauna, this invitation is considered an honor. Follow their lead. Ask questions! They won’t be offended. Whether you’re in a public sauna, joining a friend in theirs, or enjoying your own backyard sauna, you usually will take a shower to cleanse yourself before the sauna. When you are ready to enter the sauna, you should have a sauna towel or paper that you will place on the bench to sit on. You will also have a sheet to cover with as needed. Do not take any mobile devices into the sauna with you. This is about relaxation and being in the moment. Take a seat on the top bench. Move down if you feel the heat is too much for you—or even leave the sauna. The first couple of times in sauna, try to be aware of your body and what you can tolerate. The high temperature is a learned experience. Stay in the sauna as long as 10 minutes if this is your first time, and then you can cool off by jumping into a backyard pool or lake, or by just sitting outside. Be careful with this step also. The first time, your body may not like the quick cool down, resulting in a headache or nausea. After you have cooled down, reenter the sauna and repeat the process. Note: You should drink plenty of water before, during, and after your sauna experience. You do not want to become dehydrated. So, what are the possible health benefits of the sauna? Here is a list of 10 possibilities. Stress relief. In Finland, the traditional sauna is semi-dark and quiet. Conversation is allowed, but it is poor etiquette to bring up controversial or political topics. The children are taught to act as they would in church. The point of using a sauna is to refresh your soul as well as your body. You should leave the sauna feeling completely relaxed. Easing pain. The high heat will increase the blood circulation to your joints and muscles and reduce inflammation. This can be very beneficial after hard physical labor or an intensive workout. The sauna is becoming more popular with athletes after a vigorous training session or competition. Arthritis relief. As in the above example, individuals with disease processes that cause chronic pain may find that the high heat of sauna can provide significant pain relief. Heart health. A study done in Finland of over 2000 men over 20 years old found a significant decrease in heart attacks in those men who used the sauna 4-7 times per week, in comparison to those who only used the sauna once per week. In addition, the men who used the sauna more frequently had a lower death rate from any cardiac event. More studies are needed to determine if the health benefit is related to improved cardiac muscle function or if it’s related to the decrease in stress. Lower blood pressure. This can be both a benefit or a risk. If you typically have high blood pressure, the sauna can be helpful. There is evidence that using the sauna regularly over time can result in the permanent lowering of blood pressure into the normal range. However, if your normal blood pressure is lower, use caution when in the sauna. Leave the sauna if you are feeling light-headed. Always talk to your doctor about saunas before trying one. Skin problems. The dry heat of sauna can help some skin problems, including psoriasis. Decreased dementia. A study done in Finland of over 2000 men showed a significantly lower rate of dementia in those men who used the sauna 4-7 times per week. Further study is needed to determine if the sauna has truly lowered the rate of dementia or if those afflicted by dementia typically do not use the sauna. Cleansing the skin. The high heat of the sauna and the resulting profuse sweating that occurs will flush out the pores, resulting in a softer appearance to the skin. Improved sleep. There is some evidence that the use of a sauna can improve sleep. The increased release of endorphins during sauna use results in a much deeper and calmer sleep experience. Cure a cold. Well, maybe not cure a cold, but certainly lessen the symptoms. The high heat and steam of the traditional sauna can relieve sinus congestion and bring needed relief to the sufferer. Obviously, there are many benefits to the sauna—including just pure relaxation. More scientific studies are needed to verify the benefits. In the meantime, the sauna just feels good! 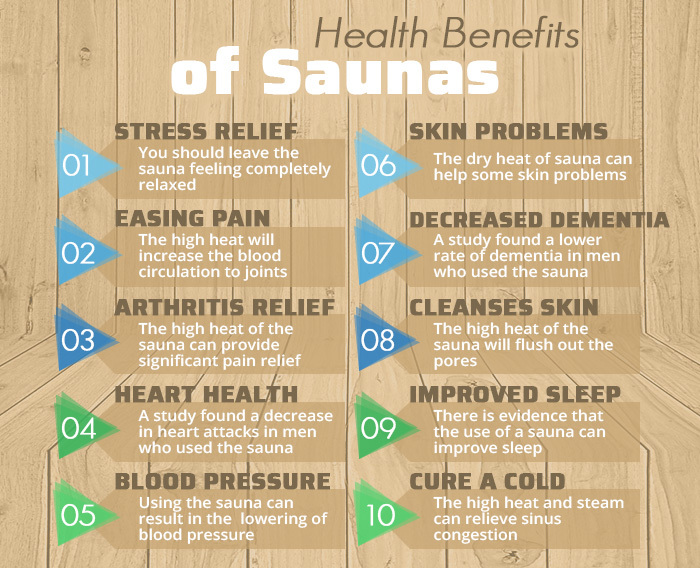 Whether you are interested in the sauna for medical benefits or mental and emotional benefits, the addition of a sauna could be the best investment in your health and your well-being that you can make.